Sen. Roland Burris has had quite a 2009 – going from one time Illinois Attorney General to Rod Blagojevich-appointed U.S. Senator. How do you cap off the whirlwind year? 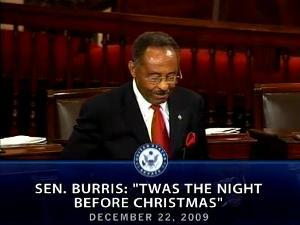 A little health care-themed Christmas poetry on the Senate floor. Out of all the health care debate viral videos that have come from the past few months – holding babies, prayers of various kinds, Stuart Smalley getting tough – this may be the most surreal. Burris was introduced to the media world (and national political world) almost exactly a year ago, and has since gone on to break away from the original Blagojevich connections. But wasn’t Blago a poetry fan himself? Maybe he was involved in the creative process. By the way, this YouTube video was posted on the Senate Democrats’ account, which means they clearly are proud of this (or they just want the extra views for their channel).